Okay, so the big kitchen remodel (and by big, I mean, lots of work, very DIY weekend warrior) began in earnest this weekend with the removal of the dreaded popcorn ceiling. So, we started where we all must, with clearing out the kitchen. As you can see, small, oddly shaped and not gorgeous. Here is the lovely popcorn. You should have seen the original light fixture. Oh. My. god. It was big, it was square, it was dark brown faux wood, it had 9 light bulbs hanging upside down off it. Could not be more ugly. Too bad I never took a photo of it! You can see its shadow lurking. I’ll likely be keeping the existing fixture as I’m not sure I can swing a new one (or at least, one I’d want) at the moment. So, this coming weekend, we’re going to be applying a joint compound to the whole ceiling and sanding to see how smooth we can get it. Oh, and we’re going to install recessed lighting at some point. 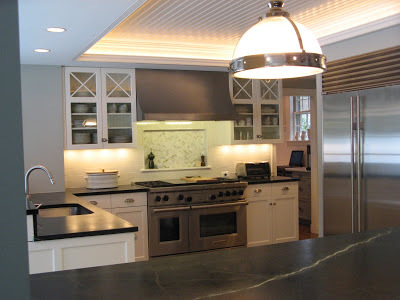 Who doesn't love a beadboard ceiling? I also like those patterned ceilings, but you already have a pretty busy floor – so I would not have the courage to combine the two. I'd opt to try to smooth the ceiling so it can be painted, but the alternatives look great, too. Removing that popcorn must have been back-breaking! Wow. It already looks better! What a lot of work. I'm so excited for you! A painted ceiling and beadboard walls sunds lovely. 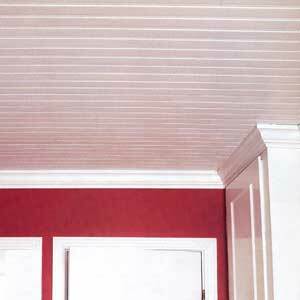 I love beadboard ceilings, especially in small rooms. They look so cozy. I also love anaglypta wallpaper on ceilings. It's easy to paint it to look like tin. 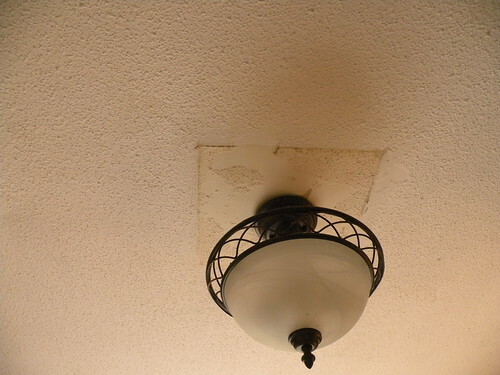 You might want to put a quick coat of primer on the ceiling before you skim it, just to make sure the joint compound doesn't pull loose in places in the future. Can't you skim coat the ceiling then paint?? I think if you can do that..that would be a great thing..if not…beadboard rather than paper! Can't wait to see the final reveal!! Well it looks like you just have trowel gouges, which a skim coat should take care of easily. I recommend skimming and priming a test section and then painting with your desired color to see how it looks. If you don't like that then my vote is the bead board! Can't wait to see what you pick. 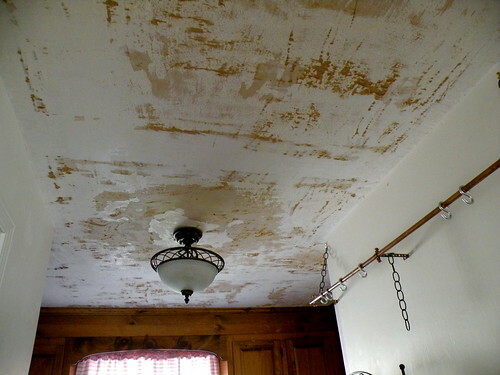 I agree…, you might have to skim coat the ceiling. Love the floor! You're keeping that, don't you! Thanks so much for mentioning my kitchen. You know I am partial to the beadboard! Such a hard job to get off the popcorn! I did it once and it was back breaking! I love the Elements of style room! I am sure with your attention to detail it will come out fabulous!! Oh why oh why oh why did ANYONE ever think popcorn ceilings were a good idea?? You should start a Save the Ceilings campaign. LOVE the wallpaper options – gorgeous patterns. Oh, Linda, it looks better already! Popcorn is awful stuff to remove. What the hell were they thinking in the 1970s & 1980s. I loathe those popcorn ceilings. They're not only ugly but a health risk. 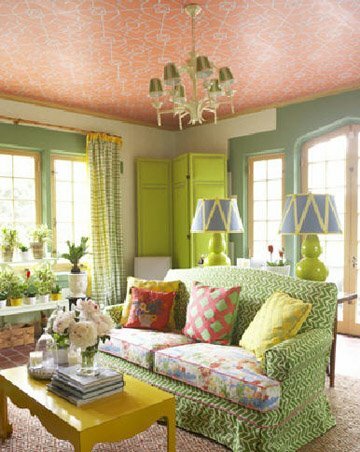 I wasn't too sure about your green painted ceiling until I saw the photos on this post. Now I want to re-paint my freshly painted white kitchen ceilings. 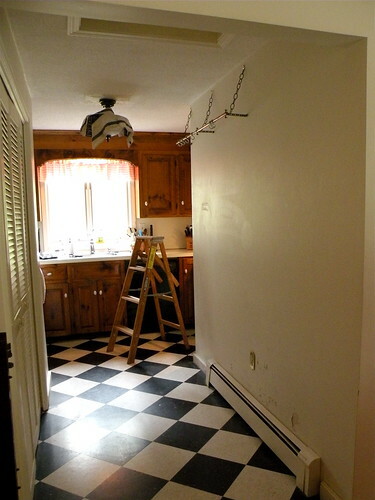 I can't wait to see the result and please keep the beautiful chequerboard floor. 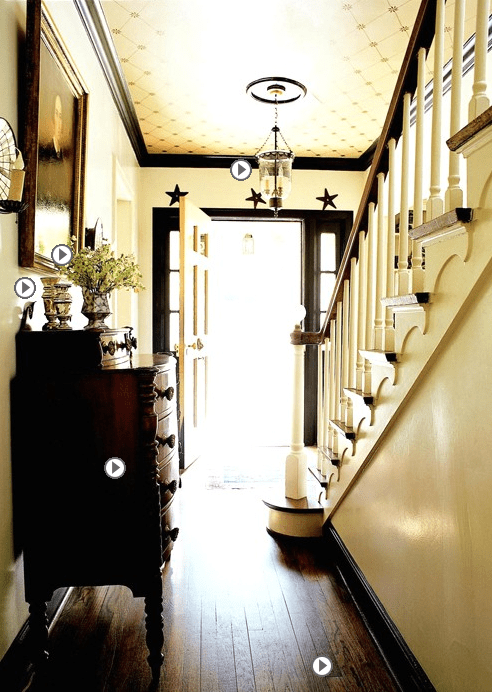 beadboard walls painted a cream color with a painted ceiling sounds wonderful. I have scraped many popcorn ceiings and it is no fun…. but so worth it. def love the cladding on the ceiling – go for it – I wish we could be we've got downlights everywhere… a bit of a nightmare for timber cladding! Here's my 2 cents…While I do love the look of bead board, unless you have high ceilings the bead board will make the space feel smaller. Ditto for a medium or dark paint or paper on the ceiling. And if the kitchen is already a small space with standard ceiling heights you could be creating an even smaller feeling space. My vote is to skim the ceiling and paint it a pretty color to compliment the other colors in your pallet, but in a lighter shade. So jealous you're able to do that. I have hideous popcorn ceiling here in NYC. Thanks for the reference! !